Marantz PM-14S1 SE. Stereo integrated amplifier. 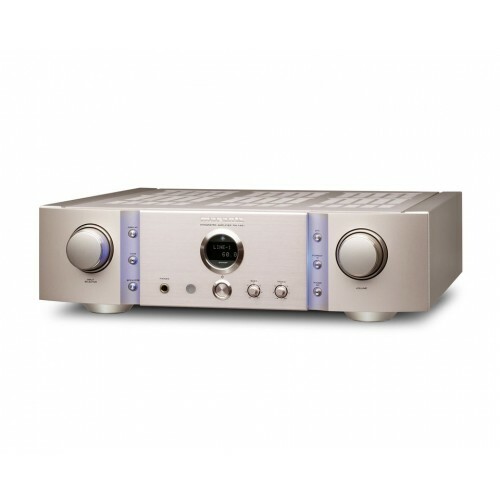 Exclusive product designed to celebrate Marantz's "Special Edition" concept, the PM-14S1 SE is an elegant integrated amplifier equipped with the same energy storage capacitor as the original KI Pearl integrated amplifier, allowing you to optimize the performance of your Oversized toroidal transformer. Thus, when power is required (nominal value from 2x90 W RMS to 8 ohms or 2x140 W RMS to 4 ohms), it instantly and effortlessly delivers a monumental tide of sound that plunges the listener into your favorite music. Strictly selected components, input bridges, state-of-the-art HDAM modules, ultra-efficient signal paths, mechanical improvements and many more undisclosed modifications enable the best tonal balance to be achieved in combination with an extraordinarily open sound scene and music reproduction in the That no details are hidden. Vinyl lovers will also revel in a phono equalizer with Constant Current Feedback topology for moving coil (MC) or mobile magnet (MM) capsules, which ensures sound characteristics identical to any volume level and over the full range Of working frequencies. Complete the PM-14S1 SE a very robust construction in which it emphasizes an aluminum top cover of 5 mm of thickness to minimize the influence of possible vibrations. In addition, the new Marantz is made in Japan. Stereo integrated amplifier of very high performance. HDAM modules and current feedback topology. Very high quality rigid chassis to minimize vibration. Power supply equipped with high current Shottky diodes. Output power from 2x90 W to 8 ohms / 2x140 W to 4 ohms. Connection terminals to solid copper loudspeakers of high purity. Dual circuit of high quality linear volume control. Audiophile grade phono equalizer for MM / MC capsules. Toroidal transformer and low noise LCD display. Dimensions: 440x127x453 mm (W x H x W).